"Proud of the @BoyScouts for making this decision today. It's simply the right thing to do." "I knew Donnie as an unsung hero who always put the needs of others above his own. He fiercely loved and guarded the neighborhood, and everyone in the C-ID respected Donnie. He will be missed for years and years to come." "The moment they begin building, programming, and learning about pulleys, gears, motion sensors, etc., the girls just don't want to leave our creativity center! They not only want to keep working, they also want to design their own models and write their own codes," explained Lavanya Jawaharlal, "We have 7-year-old girls saying they want to be scientists or engineers when they grow up." "I want to change the paradigm," said Huh. "I want to keep myself engaged and thoughtful...I'm going to be talking to a lot of entrepreneurs to look at macro-level ideas and a holistic landscape. If you had all the time in which to start a company, what would you do?" My article on NBC News Asian America--Nan-Hui Jo has been released! "We are incredibly relieved that Nan-Hui has finally been released and is one step closer to resolving this year-long nightmare. It is unthinkable that ICE was days away from permanently separating a mother from her child because of a system that prioritizes deportation quotas over the well-being of a family," said Saira Hussain, Staff Attorney at Asian Americans Advancing Justice - Asian Law Caucus, in a statement. "We must recognize this case within the context of the growing criminalization of survivors of domestic violence and the undocumented community." "As we've seen in politics and current events in the past few months, race and immigration are inherently linked in the United States," said Vargas, who was born in the Philippines, in a statement, "Since starting Define American four years ago and traveling across the country, it became clear to me that much of the opposition to immigration reform is rooted in anxiety and fear among white Americans. This TV special - aimed at white Millennials - connects the dots between race and immigration and aims to increase empathy." "Cheezburger gave rise to a new category of content," wrote Huh, "A new industry of global reach, and as some would call it: the downfall of civilization. I say, ¯\_(ツ)_/¯ bring it on, because it looks like a lot of fun. We have made a dent in the universe together." Check out my summer and fall classes at WCC. Please register early to ensure a seat! Liberal Arts & Sciences Bldg. Instructor : Frances Wang Please read: No lunch provided. Liberal Arts & Sciences Bldg. Instructor : Frances Wang Please read: Lunch is not provided. Ages 15 to 18. Chinese 1 CHN 4000 Start 09/30/15 Mandatory Fees: $10.00 Room :Rm. Finding Your Voice: Intensive Writers Workshop ENG 4290 Start 10/03/15 Mandatory Fees: $0.00 Room :Rm. Jumpstart Your Memoir ENG 4006 Start 11/07/15 Mandatory Fees: $0.00 Room :Rm. Main Campus. Instructor : Frances Wang Please read: No lunch provided. English Special Workshop: Dare to Dream ENG 4055 Start 12/05/15 Mandatory Fees: $0.00 Room :Rm. Chinese Food: Customs and Culture HUM 4014 Start 12/02/15 Mandatory Fees: $10.00 Room :Rm. Fall Chinese Conversation and Culture class beginning Sept 30 at WCC. Register early to ensure a seat. Have fun and learn to speak a new language. Using various teaching methods, the trainer will cover topics including proper pronunciation, greetings and useful expressions for daily life, identifying people and things. Learn and become familiar with culture and country knowledge including climate, history, beliefs, customs, and food. 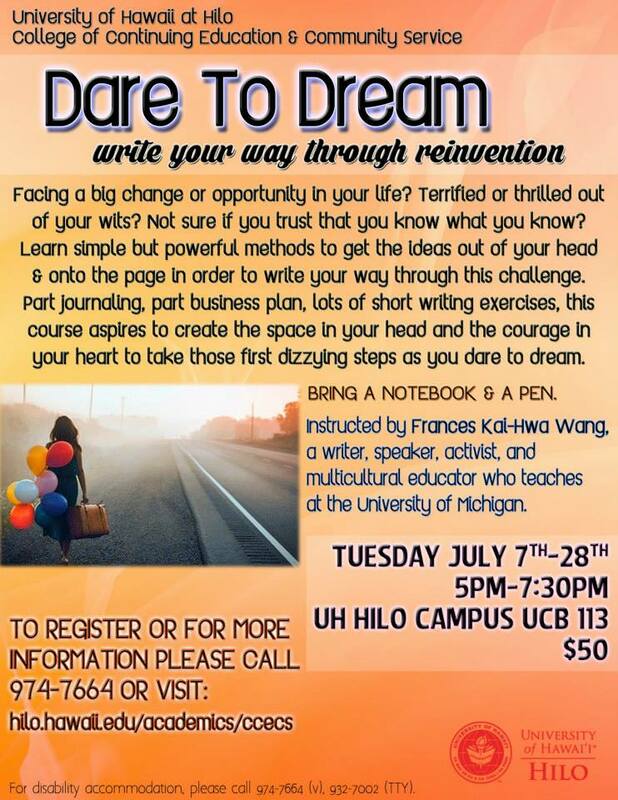 One day College Application Essay writing boot camp at University of Hawaii this summer. Have you been meaning to start your college application essays all summer? Have your parents been on your case to hurry up and get them done before school starts? What do these questions mean? Where do you even start? How do you fit it all into the word count? This course is a college application essay bootcamp to sit down and just get it done. Using timed writings and discussion, we will inventory our high school experiences, analyze various college application (and scholarship) essay questions, write a good first draft, and discuss editing techniques. Bring laptop, notebook, pen, and the application questions of the colleges/scholarships to which you want to apply. "No hotel owner wants to see human trafficking or crime on his premises," Ray Patel, president of the North East Los Angeles Hotel Owners Association (NELAHOA), told India West. "But the tactics used by the LAPD were not preventing crimes." I was watching old Sesame Street videos and singing Sesame Street songs the whole time I was working on this story for NBC Asian America. Thanks Gladys Chen for the introduction! "What I love about Sesame is that it's a world of universal acceptance: where humans, animals, monsters, fairies, and Snuffleupaguses can live in harmony. I love that the show's writers create stories for me without having to point out my ethnicity. My ethnicity is apparent. They instead write for my humor and my heart, which I find much more rewarding." "The fight against Japanese American internment today is often remembered as a struggle by three men: Minoru Yasui, Gordon Hirabayashi and Fred Korematsu,"Gil Asakawa, author of "Being Japanese American," told NBC News. "But Mitusye Endo's contribution shouldn't be forgotten. She was the fourth Japanese American, and the only woman, to fight her incarceration in an American concentration camp in the judicial system, all the way to the Supreme Court." "One potential explanation of these preferences is that contemporary media promotes certain mixed-race appearances as chic, fashionable, or post-racial," suggested Lin, "while simultaneously portrays mono-racial Asians as being passive, sly, effeminate, and nerdy." "The Muslim community and the Black community are connected in integral ways, one cannot tell the story of one in America without telling the story of the other. 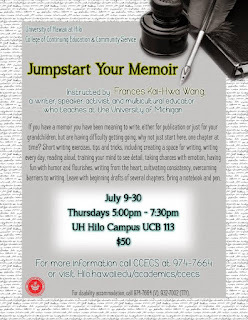 Teaching Memoir at University of Hawaii Hilo this summer. Four weeks of writing. If you have a memoir you have been meaning to write, either for publication or just for your grandchildren, but are having difficulty getting going, why not just start here, one chapter at time? Short writing exercises, tips and tricks, including creating a space for writing, writing every day, reading aloud, training your mind to see detail, taking chances with emotion, having fun with humor and flourishes, writing from the heart, cultivating consistency, overcoming barriers to writing. Leave with beginning drafts of several chapters. Bring a notebook and pen. Register now with UH Hilo College of Continuing Education & Community Service (UHH CCECS), only a few spaces left, classes starting soon! "Each of us, as humans, have hot-button topics that can set us off, and Justice Thomas had hit mine, that is clear,"
My first article at NBC News Asian America one year ago today! See how far we've come. So pleased to be a part. Thanks everyone for reading and for sharing your stories and insights with me. Teaching at University of Hawaii Hilo this month. Dare to Dream (my midlife crisis workshop). Four weeks of writing, thinking, planning, reinventing. Courage now. Facing a big change or opportunity in your life? Terrified or thrilled out of your wits? Not sure if you trust that you know what you know? Learn simple but powerful methods to get the ideas out of your head and onto the page in order to write your way through challenge. 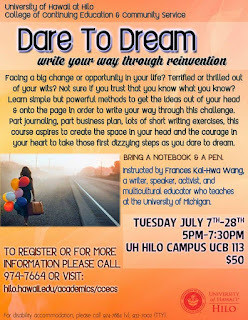 Part journaling, part business plan, lots of short writing exercises, this course aspires to create the space in your head and the courage in your heart to take those first dizzying steps as you dare to dream. Cool article about my editor, Amna Nawaz, Managing Editor of NBC News Asian America! Although 2.1 percent of adult Americans self-identified as multiracial on the 2010 US Census, when Pew Research Center also took into account the races of one's parents and grandparents, that number was much higher, 6.9 percent.